The mornings are dark, the temperature is dropping. It’s official- the winter months are here. I’ve tried to cling on to Summer for as long as possible but it is time to admit defeat and start prepping for the darker months. Starting with my skin. 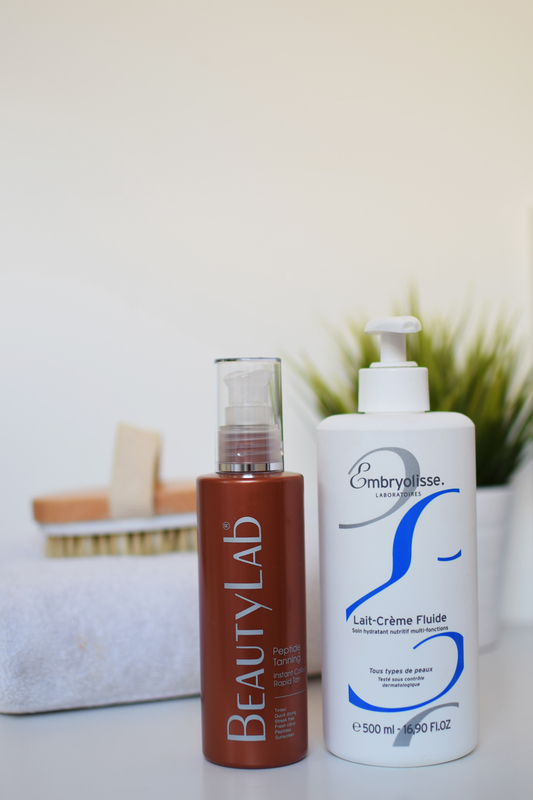 I really struggle with dull, pasty skin in Winter – I’m sure I can’t be the only one either, so I thought I’d put together my favourite ways to keep that glow. I always use a good loofah or bristle brush for a good scrub down to get rid of any dull, dry skin and whenever I can remember, I try to dry brush too. We often get sent nice loofahs by my Mother-in-law from Cyprus but I’m always a fan of the ones with massage bumps in too like this one. It’s all about the moisture. I’m always surprised when people crack out fake tan only in the summer time. I find it such a boost to have a gentle bit of colour in the dreary months and it has been a long hunt for the foolproof tan. This one from BeautyLab, the Instant Colour Rapid Tan* is a winner for me- tinted for easy application, you just rub it on with a mitt, let it dry and go about your day. It doesn’t have a strong smell at all, and then come the evening you just wash off the tint for a perfect soft tan. I’ve been applying it once a week for the perfect touch of colour. What are your essential products and tips for keeping your skin lovely in the wintertime? Fill me in! *These products were sent to me as PR Samples, but I am not being paid to write about them. My opinions are my own.